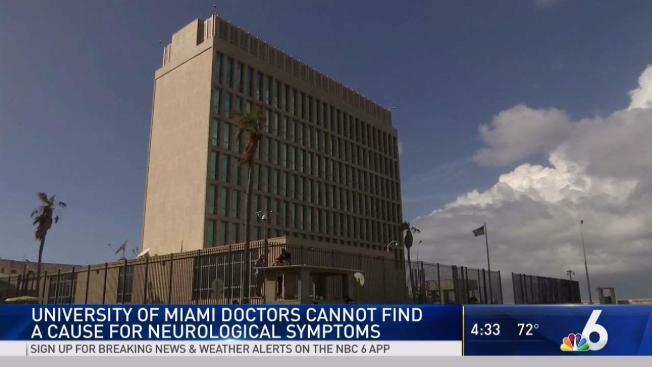 American diplomats affected by mysterious health incidents in Cuba showed damage in the inner ear shortly after they complained of weird noises and sensations, according to their earliest medical exams, publicized Wednesday. The detailed findings were published in a medical journal nearly two years after what the U.S. calls "health attacks" began — and they shed no new light on a possible culprit. "What caused it, who did it, why it was done — we don't know any of those things," said Dr. Michael Hoffer of the University of Miami Miller School of Medicine, who led the exams. The Miami researchers examined 25 of those people, who reported hearing a piercing noise or experiencing a sensation of pressure before their symptoms began. The patients failed a variety of tests that detect inner-ear problems associated with balance, what's called the vestibular system — although there were no pre-symptom medical records to compare. Those inner-ear balance problems have been central to the government's ongoing health investigation. And earlier this year, a team of doctors at the University of Pennsylvania who also examined many of these patients, but months later, reported they suffered a concussion-like brain injury, despite no blow to the head. In a brief interview with The Associated Press, Hoffer said the two studies aren't contradictory, but they have different findings because patients were tested at different times and in different ways. "Is the brain affected from the ear? Is the brain affected directly? We don't know yet," Hoffer said at Wednesday's news conference. For doctors, Wednesday's paper adds specifics about the pattern of damage, abnormalities in structures involved with sensing gravity and acceleration, said Dr. Maura Cosetti of the New York Eye and Ear Infirmary of Mount Sinai. She isn't involved with research related to the Cuba incidents. "This provides an important step in creating a picture of the injury that people sustained," she said. She added that often people with long-term balance problems also report a "brain fog." "There's no evidence that can prove that something occurred in Cuba that could have damaged the health situation of a few U.S. diplomats," Carlos Fernandez de Cossio, Cuba's director-general of U.S. affairs, said Wednesday.